We offering Road Cat Eye. Road studs or Cat eye manufactured by us are designed as per the standards and requirement of National Highways. The Tough body and retro-reflective prismatic Lens are of excellent quality for long distance night visibility for vehicles. 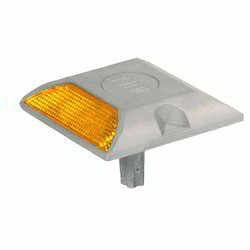 It provides and marks the road profile during night and helps the Driver for safe driving. Placed on the side of the roads, these safety products are applauded in the market for its perfect finishing. Offered safety products are manufactured with top grade material and sophisticated techniques. Our safety products are available in numerous sizes within a given time frame to suit the need of customers. We offer all type of safety products like; helmet, goggles, shoes, earplug, gloves, coverall etc. WE HAVE GOT A LARGE VARIETY OF CONE WHICH WILL SUIT ALL YOUR NEEDS. 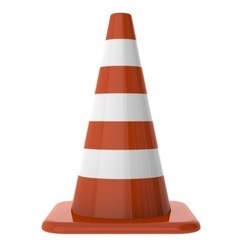 We " Vijay Hygiene Products " offer to our customers a large range of Traffic Cones. They are made up of best quality plastic material. The width and size of the products are made in great concern. They are made according to the criteria s provided. The products are made up of durable and reliable material. The base is made strong so as to give support.